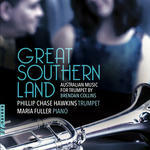 Great Southern Land : Australian music for trumpet / Brendan Collins ; Phillip Chase Hawkins, trumpet and Maria Fuller, piano. Concert Gallop was originally written for Trumpet and Piano and is published by www.hickmanmusiceditions.com. It has become quite a favourite of euphonium players and has received numerous performances in the format. 21 Apr 2013: at Music at the Court House (Kew Court House). 2013: Atlanta, Georgia, USA. Featuring Matthew van Emmerik.